His house smells like vanilla. I see a champagne bottle over ice. I sit on the brown leather couch. It's nice and firm, and looks like new. He pours me a drink. We are celebrating his dad's birthday, he is very sick, in the hospital, with cancer. Kip want's to to something special, for his dad. These size 4 jeans look good on me. I love these boots. He comes over, and holds my hand, he takes out a little black box. It's the shiniest ring I have ever seen. The couch is now mine too. It's soft, and looks like lot's of people have sat on it. I nurse Audrey on it while we all watch a movie. The couch has dog scratches and traces of spilled milk and juice. I don't even want to think about what's underneath the cushions. I wrote it on our local pupuseria's take out menu. 3 minutes goes by fast, I still have lot's to say! well you'll have to make a special post to tell us more about it. I love the history behind furniture (or other things)...it just makes it that much special. I have this old trunk that was the first piece of furniture my parents bought when they got married (and it was already old). Right before I got married my parents asked what I wanted to take with me and I didn't even have to think about it twice. I love it. Robert always makes fun of it and tells me he is going to get rid of it- year right! 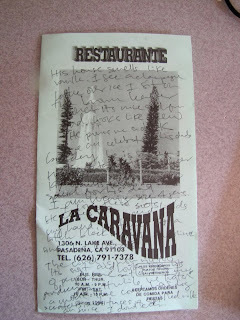 I love that you wrote it on a restaurant menu - and then shared it with us.